American Home Shield has been selling home warranties for over 40 years. They are the largest home warranty retailer in the nation. The company offers two types of plans, plus a combination plan that synthesizes the two. Policyholders also get access to additional benefits, such as appliance and filter discounts. The company has received numerous awards, including Most Recommended Home Warranty Provider by the Women’s Choice Awards, and Best in Service by HomeWarrantyReviews.com. 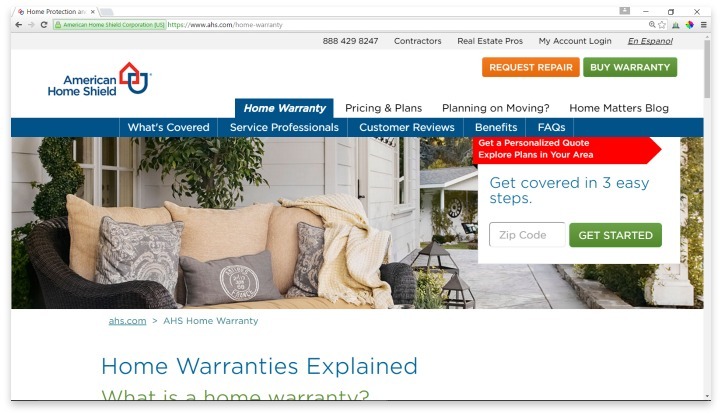 American Home Shield offers several home warranty plans. Each plan includes different home features, and covers the homeowner for one year. Coverage includes service visits for covered items, and if it irreparable, a replacement. The Appliance Plan covers most large appliances, including refrigerators, dishwashers, clothes dryers, clothes washers, ranges, ovens, cooktops, built-in microwaves, stand-alone icemakers, trash compactors and garage door openers. The Systems Plan includes the repair or replacement of air conditioning and heating units, including ductwork, electrical, plumbing, water heaters, garbage disposals, instant water dispensers, central vacuums, smoke detectors, doorbells and ceiling fans. The Combo Plan combines both the Systems Plan and the Appliance Plan, covering all items listed. Members who purchase the combo plan receive a discounted rate as to what it would cost to buy the plans separately. Consumers can also utilize American Home Shield’s Build Your Own Plan, which enables homeowners to choose at least ten items to apply coverage to. For an additional fee, American Home Shield offers add-on services that include pool and spa coverage, and coverage for water softeners, well pumps, and septic plumbing. While all plans include complete coverage for repairs or replacement, members are responsible for a Trade Service Call Fee each time a professional enters their home. There are three plans that determine the out-of-pocket cost. The higher the premium paid, the less the service will cost. Trade Service Call Fees are $75, $100 or $125, depending on the chosen rate. To request a service call, warranty holders can call 1(800)776-4663 or submit a claim through the online system. American Home Shield will then coordinate with a contractor, and facilitate the exchange of information. The contractor then goes to the home to diagnose the problem and ensure it’s covered under the warranty. If it is, the contractor makes the repairs or an arrangement for a replacement is made. Because American Home Shield offers coverage throughout the nation, they work with thousands of contractors. This could easily lead to shady contractors taking advantage of the system, but many consumers report fast, friendly service from the contractors who entered their homes. This could be due to American Home Shield’s approach. They require contractors to apply to be a part of their system. They then provide continuing education, and offer bonuses for contractors who perform with excellence. Premiums vary depending upon location and desired coverage. American Home Shield is a very large and well-established company with an extensive network of contractors. They offer several home warranty plans. American Home Shield is a very large and well-established company, which has allowed them to develop an extensive network of contractors. Their size has also led to thousands of reviews online, which establish a pattern of pretty decent service and high customer satisfaction with their claims process that many report is fair and simple. Have you had an experience with this company? Please share your American Home Shield reviews below.